Decision making is an important part of programming. It is used to specify the order in which statements are executed. In this lesson, you will learn how to create decisions using different forms of if...else statement. 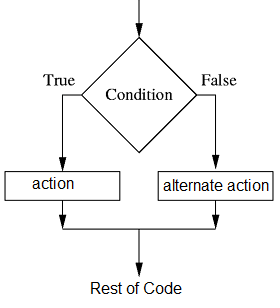 In Java, an if statement is a conditional statement that runs a different set of statements depending on whether an expression is true or false. In the above syntax, the if statement evaluates the test expression inside parenthesis. If test expression is evaluated to true (nonzero) , statements inside the body of if is executed. If test expression is evaluated to false (0) , statements inside the body of if is skipped. You have passed the exam !! In the above code, the if stat evaluate the expression is true or false. In this case the totalMarks>50 is true, then the control goes to the body of if block , that is the program will execute the code inside if block. The else statement is to specify a block of code to be executed, if the condition in the if statement is false. The else clause of an if...else statement is associated with the closest previous if statement in the same scope that does not have a corresponding else statement. You have failed the exam !! In the above code, the if stat evaluate the expression is true or false. In this case the totalMarks>50 is false, then the control goes to the body of else block , that is the program will execute the code inside else block. If you want to evaluate more than one conditions at the same time , you can use else if statement in Java. Multi selection enables the developer to determine the actions that have to be accomplished in certain conditions by imposing a requisite. You can combine an else and an if to make an else if and test a whole range of mutually exclusive possibilities. 2 : If total marks greater than 80 show message - "Got Higher First Class "
5 : If total marks greater than 60 show message - "Got First Class "
8 : If total marks greater than 40 show message - "Just pass only"
10: If those three conditions failed program go to the next coding block . 11: If all fails, it will show message "Failed"